Bulk Personalized Nylon Drawstring Backpacks w/ Mesh Pockets. Promotional, Inexpensive. Budget Prices in the USA and Canada. Tricolor. Bulk custom imprinted drawstring nylon backpacks with side mesh pockets and front pockets. Ideal for school children. Our top quality tricolor backpack bags are made of sturdy 210 Denier nylon and provided with two pockets and drawstring closure. We also supply wholesale blank (not imprinted) nylon backpacks. 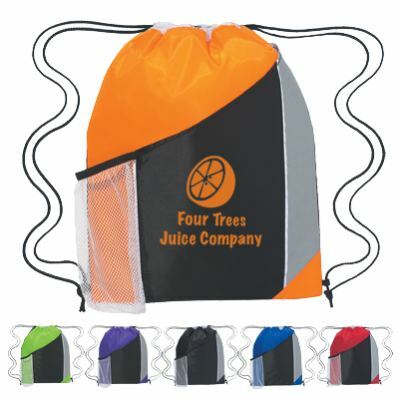 Budget Prices in USA and Canada for wholesale nylon drawstring backpacks. American clients pay no taxes.